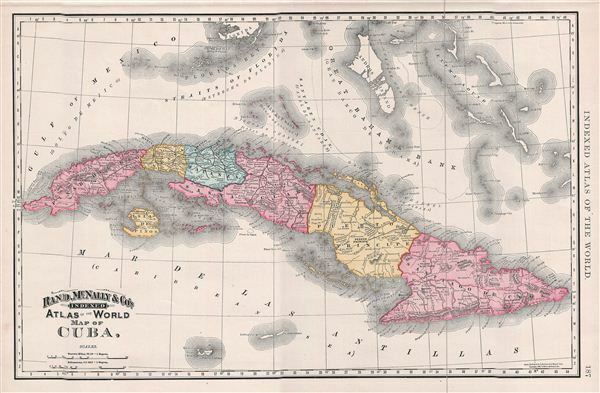 A beautiful example of Rand McNally and Company's 1892 map of Cuba. The map covers the entire island of Cuba including the Salt Sea Banks and the Isla de la Juventud or the Isla de Pinos (Isle of Pines) as it was until 1978. A divisional line dividing the island into two dioceses viz. archbishopric of Santiago de Cuba and the bishopric of Habana is noted. Three years after this map was created, the Cuban War of Independence, the last of the three wars against Spain would begin in 1895 and would eventually lead to the Spanish-American War of 1898. As a result, Spain would be forced to cede the Philippine Islands, Puerto Rico and Guam to the United States, as well as relinquish sovereignty over Cuba. Color coded according to regions and territories, the map notes several towns, rivers, cities, railroads, mountains and other topographical details with relief shown by hachure. This map was issued as plate no. 187 in the 1893 issue of Rand McNally and Company's Indexed Atlas of the World- possibly the finest atlas Rand McNally ever issued. Rumsey 3565.052 (1897 edition). Philip (atlases) 1026 (1898 edition).